Peak Integration Algorithms… Hmmmm Which one to use? This is a question that comes up almost daily. So from the perspective of someone who has been using many flavors of mass spec software, none of the choices of any vendor is exactly ideal. Here in Thermo our two most commonly used detection models are Genesis and ISIS. Now somewhere in time, the naming convention got lost and it’s hard to know which one to use in the right situation. So here’s 10 years of experience in using these, in many forms of data. Genesis is good for detection of peaks in a noisy baseline. Typically in full scan types of data collection. So Single Quads, Ion Traps, FID and PDA data sets. I use these points typically as a good set of default values: Nearest RT, Smoothing of 3, and signal to noise threshold of 5. The rest of the values can be used for fine tuning but these are my basic starting points. ISIS is good for more abstracted data with cleaner baselines. Typically SRM, SIM and CRM scan types of data collection. So Triples Quads, MS3 systems, and Exactive instruments. MINIMUM PEAK WIDTH – This really comes into play when dealing with different types of chromatography. Narrow peaks I use 3-5 (scans) as my minimum. So GC and UHPLC types of data. For LC/LCMS I use typically 20( scans), because these chromatographic peaks are wider and usually noise peaks are much narrower. Again this is a rule of thumb and a starting point. 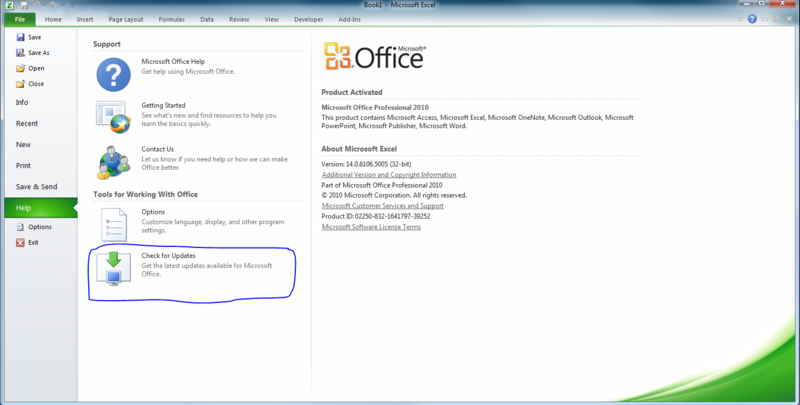 In some cases TraceFinder custom report have been effected by installations of Office 2010. The issue is that each chromatogram on a custom report is a copy of the first chromatogram displayed in the report. To correct this downlaod the attached file, copy and overwrite the same file in the folder “C:\Program Files\Microsoft Office\Office12\Library”. TraceFinder can store batches on a remote mapped drive on a companies network. One issue that may arise is latency/slowness of the network itself. Remeber the processing occurs on the local PC, so files and results have to read and written to disk by passing through the network. If the storage disk is very far away or the network has heavy traffic, processing will slow down. A remendy of this is to locate the storage server within the building of the laboratory or have a dedicated line. Also TraceFinder 2.0 and above can be installed in a Cloud configuration where the processing and storage are on a remote server, with multiple instances capable of being hosted. This allows the user to see via a browser the application and process and review results without the latency issue. Running on systems with Windows 7 and Office 2010 have had some issues with sluggish response over time with TraceFinder and Xcalibur. There seems to be an issue with memory leakage that is addressed in current Windows and Office updates. Especially surrounding the Excel 2010 installation. 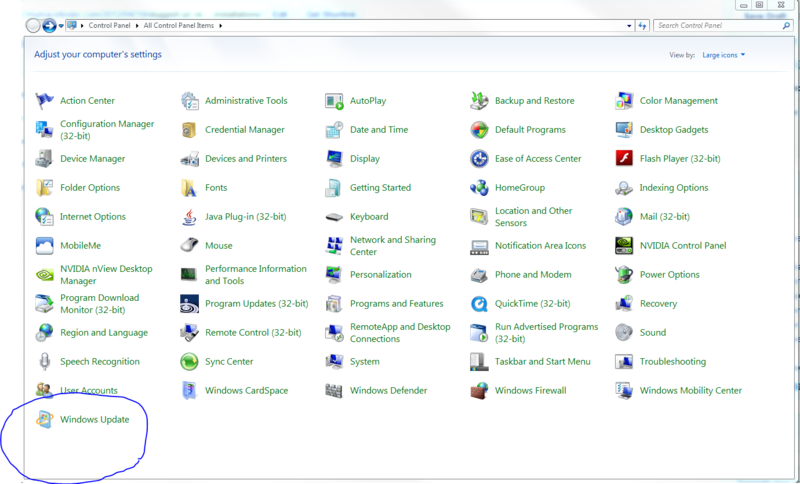 The solution has been to update Windows 7 to the latest update/hotfixs and to update MS Office with its latest updates or Excel if the is the only office component available. Easiest way to do this is connect to the internet and choose update Windows from the Windows Update icon in the Control panel. The updates for each can be downloaded from the Microsoft.com/Downloads section of the Microsoft website. In TraceFinder, the lowest form of identification is the peak, but the lowest form of data aggregation is the compound. Unlike Xcalibur and LCquan, where each individual trace is a component or associated with a single component, TraceFinder allows for the compound to consist of up to 6 quan components. Each of these components CAN, but does not require, be associated withup to 10 confirming peaks. Each Confirming Peak is assigned a ratio to the associated quan peak. The relation ship of a Quan to a Confirming lies in that they must exist at the same point in time, thereby they must co-elute chromatographically. Also they must exist in a specified or calculated abundance to each other. Again, unlike Xcalibur and other apps from Thermo, these two peaks do not have to exist in the same Mass Filter. The Mass Filter is a designation in the data file that narrows down where to recover the Time and Intensity pairs of data that represents the abundance of an ion at a particular point in time. This is what is used to construct the 2-D chromatographic plot. This means that in a SIM experiment a quan peak can be select from one mass filter and the confirming ion can be from another. In an SRM experiment the quan peak could theoretically be from a positive precursor-product filter and the confirming could be from a negative precursor-product filter. 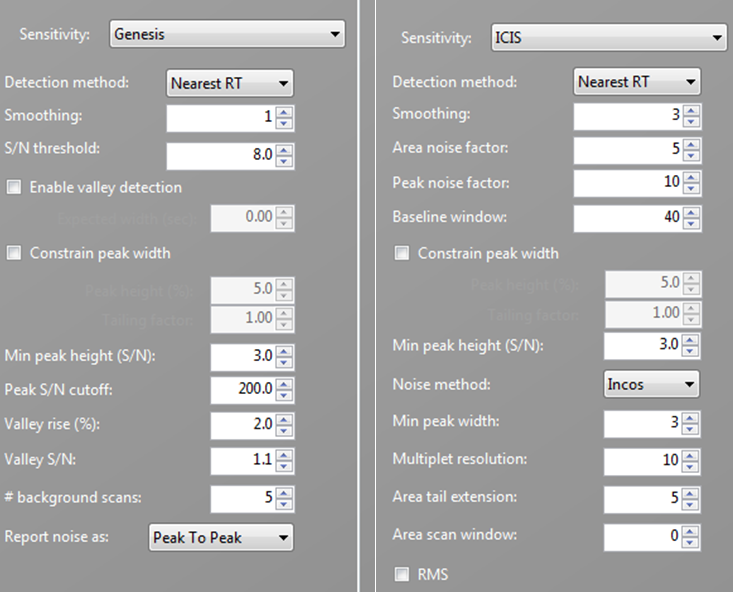 In a Full Scan High Resolution Scan experiment,as from an Exactive type instrument, a Quan peak can be selected from a full scan and the confirming peak can be selected from a HCD or AIF scan. By utilizing this technique with no calibrators samples in a batch of samples a chemist can conduct a screening assay for the present/not present answer set. The next unique quality of this flexible designation is that multiple quan peaks can be selected for a compound and be from separate filters and at different retention times. this would allow for multiple peaks to throughout the chromatographic assay to represent the total response of a compound. This would be best illustrated by compounds that use chiral separations, where one isomer would elute faster than another but the response of both need to be summed as the total response for the calibration curve and amount calculations. By utilizing this feature there is no exporting of results grids to excel or a LIMS system just to calculate the total compound.